The 50-1000ml Disinfector filling machine is suitable for low viscous liquid bottles containers that are less than 1000ml in volume. 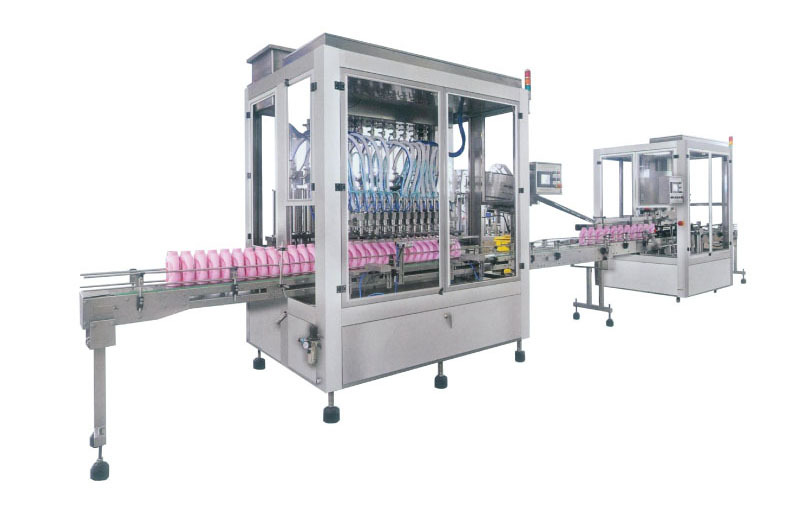 With an automatic bottle unscrambler, filling machine, rotary capping machine, gluing/self-adhesive labeling machine, the chemical packaging line is a complete production line that packages and seals cartons. This fast and efficient bottle packaging machine processes low viscous liquids such as cleaners, liquid soaps and other low viscous liquid and applies anti-theft caps. 1. Only need three people (one operator, two assistants) to operate this production line. 2.Fast and efficient unscrambler suitable for flat and round bottles and easy to adjust for size. Fallen bottles will be returned to the elevator and the unscrambler will alert operator to unfilled bottles. 3. Servo volumetric filling machine is highly precise. Filling nozzles automatically adjust to different bottles and reduce foam. 4. The rotary capping machine is 100% qualified and rejects dented or broken caps. 5. The automatic carton opening and sealing machines are easy to operate and speed up production.